Long gone are the days of consumers shopping only at physical stores. With the help of the internet many retailers do most of their business online, and businesses not utilizing ecommerce are caught scrambling to create an online presence. By year’s end, economic forecasts expect American e-commerce sales to surpass a half trillion dollars with approximately three in four Americans making at least one online purchase per year. It would appear that the continued growth of e-commerce does not appear to be slowing down any time in the near future. It is expected that trends continue with more and more retailers and vendors responding to the migration of sales from physical retail to online retail, by placing a greater emphasis on their online marketplace. Because of this, just as you would see with a gold mining town’s Main Street, these virtual storefront spaces will be in greater demand and thus cost substantially more. So, if you are building a website, one of the toughest and most crucial choices you will eventually have to make involves selecting the ideal website domain name. Picking the proper name, one that is available, within your budget, SEO applicable, and that helps to build your brand can make or break your business’ online performance. 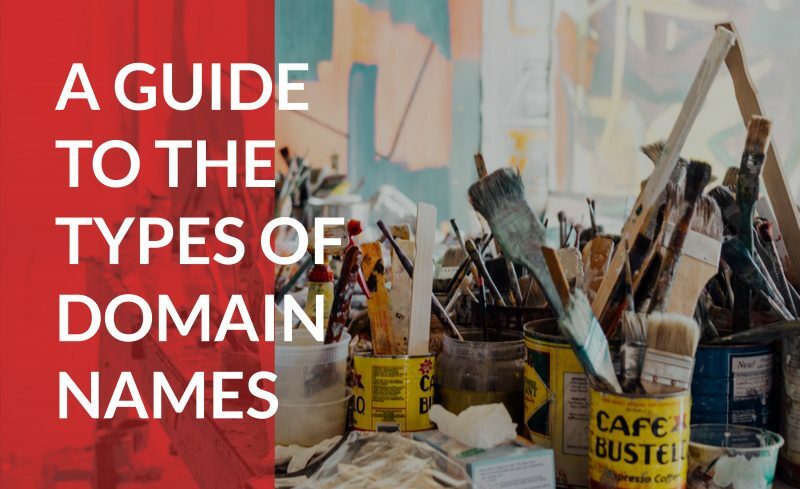 You likely already know this, but did you know that there is more than one type of domain name? Before you go about finding a domain name and domain name extension that is available and suits your brand, it is important that you discover all the different types and understand their application as a whole. So, let’s start with what a website domain name is. At its essence, a domain name is what goes in between the protocol sign (HTTP://) and the first slash in a URL or web address. So, for the URL: https://www.domain.com/hosting/, the domain name would be: domain.com. What you might not notice or see nowadays is that this domain is a stand-in that represents the computer or website’s IP address. Every single device that uses the internet, is given an IP address. That IP address is a distinctive identifier ascribed to the device that cannot be used by a different device simultaneously. In order to form a rudimentary virtual address book, computer scientists created the Internet Protocol Address System. They assigned both computers and websites a unique 32-bit or 128-bit string of digits known as the IP Address that could distinguish them from others. While this initial system did work, it was still complicated for even computer scientists to communicate effectively, let alone for a less computer savvy person. Computer scientists then created the domain name system, whereby website owners could register a unique name that acted as a synonym or stand in for the IP address. The Domain Name System functions by converting the domain name into an IP address character set, via a Domain Name System server. This system is situated on millions of servers the world over but acts as a single unified database. Now, when you put the domain name in your search browser, the browser will then communicate with a name server in order to find the IP address that is matched to that name. If you have not previously requested a domain name that request will go through a server that sorts by the Domain Name System hierarchy, starting with top level extensions and then moving on down the line. Unsurprisingly, this made the worldwide web infinitely easier to navigate, which encouraged more people to utilize its services. Create a lasting first impression: A domain URL is the very first thing a prospective customer will see and is their initial interaction with your brand. A unique or memorable domain name will speak to what they want and stick in their head. An unfitting domain, on the other hand, can turn off prospective customers. Define your brand: A domain name can be used to instantly speak to your brand, letting the customers know who you are and what you are selling. A relevant domain name can help key your customers in on your product, or a unique domain name can create a link that associates your name with your product. Optimize SEO: Search engine optimization utilizes keywords in order to help your SEO rankings. Exact match domains are not necessary, but it is helpful to use a domain that is close. As mentioned, there is a hierarchy within the domain name registry that distinguishes domains from one another. .com: shorthand for commercial, .com was the first top-level domain in common use. While .com was initially created for use by commercial organizations, restrictions on this were not stringent. By the mid-1990’s, .com had become the most popular and commonly used type of top-level domain for businesses, websites, and email. .net: shorthand for network, .net was created expressly for institutes that partook in network technologies such as an internet service provider or an infrastructure company. Like with .com, the restrictions meant to limit .net to networking purposes, was never upheld and it became one of the more popular top-level domains, with many seeing it as a close second to using the .com top level domain. .edu: shorthand for education, .edu was made for education institutions. Although it was intended for universities everywhere, the TLD .edu became associated with only educational centers in America. Schools from other countries will use .edu in conjunction with their country-level domain, which we will discuss in the next section below. .org: shorthand for organization, .org was created for nonprofits. As we’ve seen with these other top-level domains, such intentions were often not upheld or enforced over time. These days, .ors is used as top-level domain by nonprofits, for-profit businesses, schools, and communities. .mil: shorthand for military, .mil was created expressly for U.S. military branches. Unlike the other different types of top-level domains, this restriction is still upheld. Now, it is quite common for .mil to use second and third-level domains in conjunction with the .mil TLD. .gov: shorthand for government, .gov, like .mil, was restricted for American federal governmental agencies and personnel use only. These days, .gov is used by governmental agencies, programs, cities, states, towns, counties, and native American tribes. In order to distinguish one country from another, especially one that would like to use a top level domain such as .gov or .mil, two letter domains were established and became associated with countries or geographical locations; .uk and .au, for example, to represent England and Australia, respectively. When initially created it was intended for registration to a corresponding ccTLD to be limited to that countries residents, however, certain countries have let outside parties register domain names using their country code. This was a top-level name with an encoded format that lets non-Latin character sets or other special characters be used. Generic (.com, .net, .org, .info), domains that can be used for general purposes. Generic restricted (.pro, .biz, .name) domains that can only be used for their specific purposes. Sponsored (.edu, .gov, .int, .mil, .aero, .cat, .asia, .mobi, .coop, .travel, .tel, .jobs) domains that can only be used by businesses involved specifically with that industry. Infrastructure (.arpa) which was one of the original top-level domains used to help with the DNS infrastructure. Within the DNS hierarchy, second-level domains are domains that follow top-level domains. For example, in Nike.com, Nike is the second-level domain of the .com top-level domain. Quite often, second-level domains are the name of the business or vendor that registered the domain name with a registrar. The brand name, company name, or project name is the identifier for potential customers. On top of these general second level domains, there are also country code second-level domains (ccSLD). In such cases, the second-level domain will be found to the right of the period; for example, in a domain such as nike.co.ca, the country code top-level domain is .ca and the ccSLD is .co. Within the DNS hierarchy, third-level domains naturally follow second-level domains. They can be found to the left of SLD and are often referred to as the subdomain. Larger companies will often use third-level domains as identifiers that can distinguish between various departments. Generally speaking, “www” is the most common third-level domain. If a company does use multiple third-level domains, those are generally referring to a specific server within the company. There are many different types of domain names out there waiting to be owned. But before you can do anything with one, you need to know how to register your domain name. If you have a domain name you want to use or check for availability, you must first register with the Internet Corporation for Assigned Names and Numbers (ICANN). ICANN assigns and categorizes different types of domain names and ensures that the process goes smoothly. In order to register a name with ICANN, you must use a domain name registrar. We at Domain.com are a registrar’s service that can help you launch a website or register a domain name. Your contact info; including first and last name, payment info, billing info, physical address, phone number, and email address. The chosen domain name registration term. We can’t stress enough how important it is to find the right domain name for you or your business. The importance of having a good domain name can sometimes get thrown to the wayside but in reality, a domain is a root that grows the tree of your business.